Eighty-five years after Clyde Tombaugh discovered Pluto, we’re finally getting an up-close and personal look, thanks to NASA’s New Horizons mission. As a planetary astronomer who has investigated the formation of Pluto and other planets for nearly two decades, I’ve been waiting for New Horizons’ approach since it was launched in 2006. We’re finally receiving the first detailed pictures of the icy dwarf planet. Data from the spacecraft should tell us more about the composition of the materials that originally spawned our solar system’s planets, and the nature of geological processes on icy planets. Over the past month or so, as New Horizons approached the end of its three billion mile journey from Earth to Pluto, NASA has released a stunning set of images from the mission. 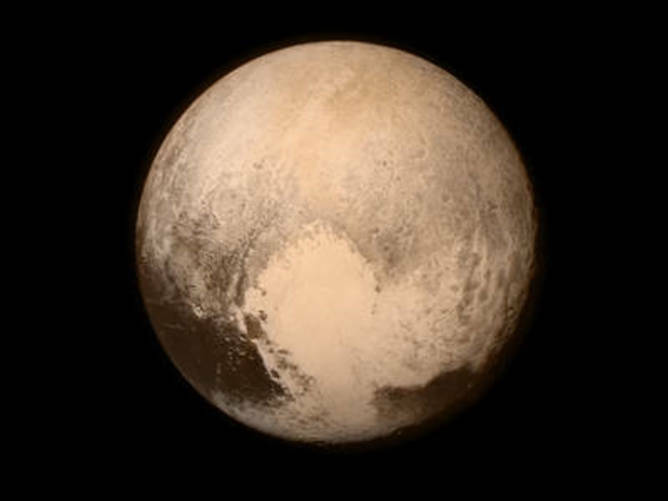 We now know that from a distance, Pluto has peach-colored surface features that resemble a heart, a whale and a doughnut. 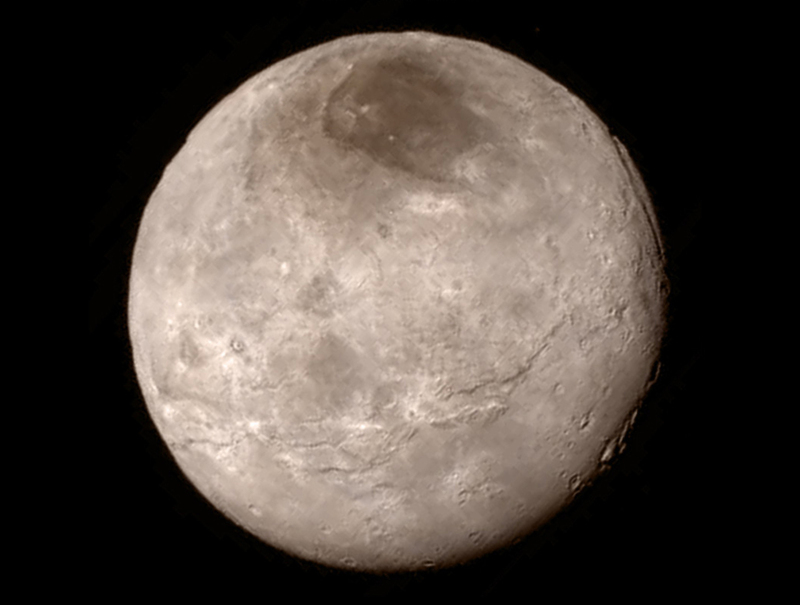 Pluto’s gray moon Charon has a dark polar cap (unofficially named Mordor) and several bright craters. We’ve seen four smaller (6–63 mile, or 10–100 km, diameter) moons orbiting the Pluto–Charon binary. Discovered by the Hubble Space Telescope, moons Styx, Nix and Hydra are bright and probably icy, but Kerberos looks like a lump of coal. Despite the high quality of these images, what everyone was really waiting for was “closest approach,” when several instruments would finally be able to resolve kilometer-sized features on the surfaces of both planets. These instruments can spot cracks like those on Jupiter’s moon, Europa, and geysers like those on Saturn’s moon, Enceladus. On Tuesday, New Horizons successfully zoomed by Pluto. Here’s what the probe saw. An artist’s conception of New Horizons passing Pluto. 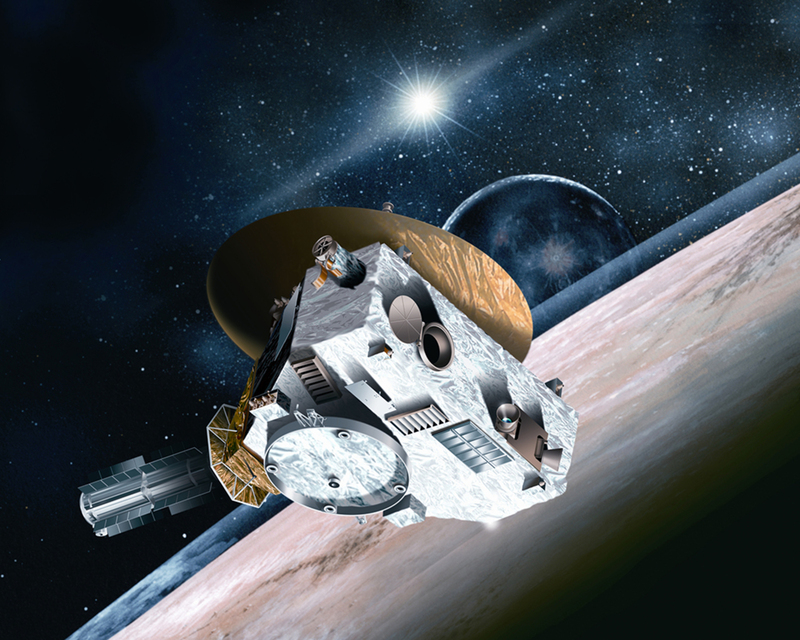 Traveling at about 31,000 mph (14 km/sec), New Horizons’ seven instruments had to work quickly during the fly-by. Pluto is two-thirds the size of our moon; its binary companion, Charon, is only half the size of Pluto. Following a path that passes only 8,000 miles from Pluto (and 18,000 from Charon), on-board cameras snapped pictures of the surfaces of both worlds. Other instruments collected data on surface compositions, the extent of Pluto’s atmosphere, and the amount of dust orbiting them. After only 10 minutes, closest approach was over and New Horizons sped away from Pluto and the solar system, never to return. Over the next 16 months, the on-board computer will patiently transmit all of the newly collected data back to Earth. With a slow data rate of only 1 kb/sec, it takes 42 minutes to transmit just one image. 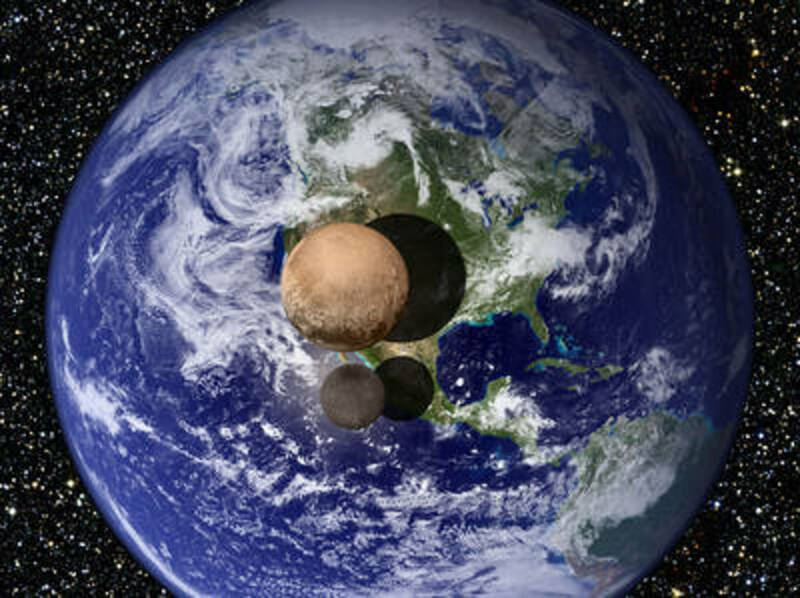 Pluto and Charon superimposed onto the Earth. The first set of images shows spectacular vistas on Pluto and Charon. 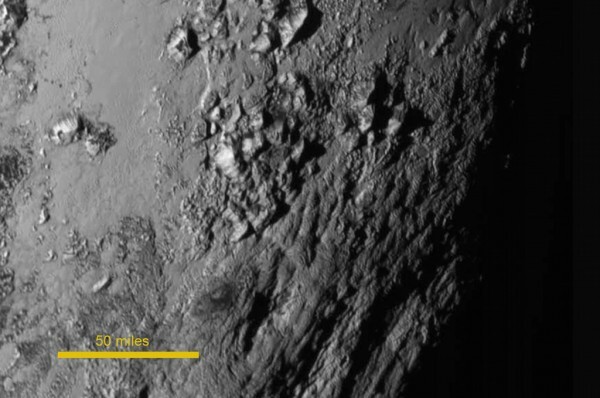 Pluto has magnificent 11,000-foot mountains! Relative to the size of Pluto, these mountains are comparable to a 65,000-foot mountain on Earth – more than twice the height of Mount Everest. Aside from many craters, Charon has a large dark region, deep valleys, and prominent cliffs. One of the canyons is four to six miles deep. Relative to Charon’s radius, this canyon corresponds to a 37 mile (60 km) deep canyon on the Earth – over 30 times deeper than the Grand Canyon! These data will help to complete a “fossil record” of the early history of the solar system. Nearly all stars like the sun form with a “protosolar nebula,” a disk-shaped collection of gas – mostly hydrogen and helium – and micron-sized dust grains. Over time, these tiny dust grains agglomerate into small pebbles. Pebbles grow into boulders, then mountains and finally planets. The inner parts of this protosolar disk are warm, too warm for water to condense out of the gas. Agglomeration here leads to rocky planets like the Earth and Venus. The outer parts of this disk are very cold. Ices of ammonia, methane and water condense out of the gas onto the grains and pebbles, leading to icy worlds like Pluto and Charon. When icy worlds get large enough, they collect hydrogen and helium from the disk and grow into gas giants like Jupiter and Saturn. From the extreme pressure of the overlying gas, the iceball that became Jupiter has been crushed into a core of metallic hydrogen. Pluto can tell us what that iceball was like 4.5 billion years ago. The canyons, mountains, and valleys on Pluto and Charon help us learn how rapidly Pluto and Charon formed. When planets form in a few million years, heat generated from collisions and the decay of radioactive nuclei melt the core (and sometimes, like the Earth, the entire planet). Within this liquid, heavy atoms like iron sink to the center; lighter atoms like oxygen rise to the surface. The planet becomes differentiated, where its various constituents separate into different layers based on their densities. Differentiated planets have geysers and oceans. On Pluto and Charon, any surface water freezes quickly. But internal heat from radioactive decays and tides can maintain a subsurface ocean. This kind of vast underground reservoir of water keeps a planet round. Once New Horizons measures the “roundness” of Pluto and Charon, we will know whether either has a subsurface ocean. If they do, they probably formed rapidly. Today’s images suggest Pluto and Charon are geologically active, differentiated worlds. Perhaps they have underground oceans. Once all the data are analyzed, we’ll know for sure. Charon’s newly clear topography in a New Horizons image taken July 13 2015 from a distance of 289,000 miles. Personally, I’m looking forward to data that can test the “Giant Impact” hypothesis for the origin of the Pluto–Charon binary. The hypothesis states that Pluto and Charon formed in separate locations of the protosolar nebula. Much later, Charon skimmed the surface of Pluto and kicked up a lot of icy debris. Tides between Pluto and Charon stabilized their orbit, locking them into a structure where each has a “day” equal to their 6.4 Earth day orbit around a common center of mass. 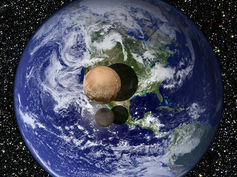 With this tidal-locking, one hemisphere of Pluto perpetually faces one hemisphere of Charon. The four small moons formed out of the debris. For the next month or two, New Horizons will continue to collect images of the Pluto system. Once all these data are transmitted to Earth and analyzed in detail, we will know more about the shapes of Styx, Nix, Kerberos and Hydra. If these moons grew out of smaller particles in the debris from the Pluto–Charon collision, they should be round. If the moons are large fragments from the collision, they should have more jagged, irregular surfaces. Hydra appears to be irregularly shaped. 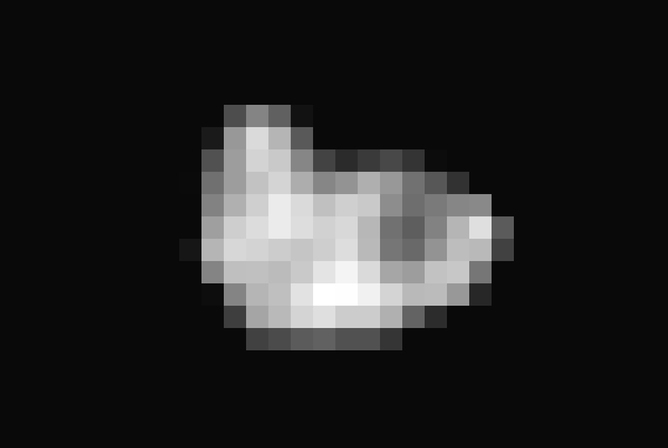 From the image released today, Hydra looks like an irregular fragment with bright and dark features on its surface. Once the New Horizons team processes all of the Hydra images, we will have a better idea of its true shape. Now that New Horizons has done its job, scientists around the world will begin to analyze the data. It may take several years, but I am sure we will have some amazing surprises. In the meantime, we can rejoice that we live in an age where our tools can visit worlds throughout the solar system. And we can all enjoy the beautiful images of Pluto, Charon and their family of small moons. Scott Kenyon is Senior Astrophysicist at the Smithsonian Astrophysical Observatory at Harvard-Smithsonian Center for Astrophysics.